The first freshman pitcher to start a Jesuit High School playoff game, Anthony Susac delivered a 1-0 victory over Franklin. The playoff pressure cooker here has devoured many a good pitcher over the years – aces chased off the mound amid a flurry of base hits and sagging confidence. 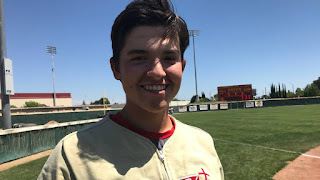 So imagine the varied emotions when Jesuit High School trotted out Anthony Susac on Saturday afternoon at Union Stadium to face a team that just beat the Marauders twice down the stretch of the Delta League season. The freshman is so new to the varsity scene that his jersey number wasn't included on the game program. Carter Benbrook drove in Daniel Susac with a base hit in the top of the first inning, and Daniel's cousin Anthony outdueled Franklin's Grant Stevens from there. At 6-foot-3 and 210 pounds, Anthony Susac doesn't look the part of a freshman. Nicknamed "Tonko," he struck out seven in the first three innings and finished with 10 in 5 2/3 innings, allowing three hits. It was Susac's second varsity outing. He allowed one earned run in a 6-2 victory over Vacaville on May 5 in a nonleague game. It was the first time coach Joe Potulny, at the Marauders helm since 1993, ever started a freshman pitcher, never mind in a playoff game. Adding to the intrigue, Susac is a big name at Jesuit. Andrew Susac, Daniel's older brother, was a Marauders star 10 years ago and is a catcher with the Baltimore Orioles. Daniel and Anthony have been batterymates their entire baseball lives, including Saturday in the biggest outing of their young careers. Daniel, a sophomore, holds the distinction as the first freshman Potulny called up to varsity. The only four-year varsity player in the history of the program, dating to 1963, is Phil Cantelme in the late 1970s. He's a longtime Jesuit assistant. "I may have to cut Daniel so Phil can remain the only four-year varsity guy," Potulny said with a laugh. The coach exhaled while sizing up the impact of all the Susacs who have marched through. "The Susac family," Potulny said, "is not a normal family. Great people, great athletes, all so mentally strong. And the kid today was impressive." Susac went 7-0, struck out more than 100 and held a sub-1.00 ERA on the freshman team this season, Jesuit freshman coach Ken Ramos said. He struck out 17 in one game and 15 in another. How inhumane that must have been for those freshman batters. "I kept telling Potulny that Andrew was ready for varsity, and what a joy of a kid to coach," Ramos said. "He was like our secret weapon for varsity in the playoffs, our 'Lincecum Ninja.' Wow." Susac congratulated teammates after stellar defensive plays, and he tipped his hat to his defense when he left after his 110th pitch, the maximum allowed at this level. He was embraced by coaches and teammates before he got to the dugout. There was a sense that Susac dominance might become something of the norm. "He put in a great effort," said Jesuit's Benbrook. "We needed him step up, and he did. He's old for his age, like a fourth-year varsity guy and not a guy in just his second varsity game." "I'm always a little nervous taking the mound, but it shows you care," said Susac. "They rolled the dice on me in letting me start. They trusted me, and I couldn't ask for anything more. My team played great behind me. The guys respected me, and they don't treat me like a freshman, and I like pressure. I love it." The only anxious Susac here was John Susac, father of Anthony. He's an assistant coach, and he paced liked an expectant father. He was still jittery well after the game. "Anthony was great – so proud," John said. "I couldn't predict how he'd do, but I did know he'd handle it. He had no choice to handle the pressure, and he did. I was worse than he was – nervous." Luke Wolger and Luke Williams cleaned up in relief of Susac for Jesuit (22-9). Williams struck out two in the bottom of the seventh to deny Franklin (23-7). Jesuit inched a step closer to its sixth section championship since 1994 and its first since repeating in 2009 when Andrew Susac stormed onto the scene as a dominant catcher and team leader. A Delta League team has won the section D-I title five consecutive seasons and 14 times since 2000. Franklin drops into the loser's bracket that starts Tuesday at Sac City.